Use Everyone Bubble Bath in the eucalyptus + citrus scent and chill out with a blend of lemon, lemon myrtle, orange and eucalyptus essential oils. Everyone Bubble Baths are formulated with coconut-derived cleansers for incredible bubbles that are gentle on skin and the planet. My husband loves bubble baths, and this is his favourite brand. Good bubbles and nice scent. Happy with the ingredients, fragrance and how little I need to use, just a few squirts! This is the best smelling bubble bath I've ever used. A little goes a long way, and the bubbles last a long time. The kids love it and smell so good when they're tucked into bed. I've tried a lot of bubble baths for my daughter and most natural brands don't work very well. This smells great and the bubbles last a long time. It doesn't leave any residue and no itchy skin after. Great for mom too. Like other buyers have said, the bubbles last forever. This stuff is great. I used to buy the kids branded ones for my kids but now use this one because they love the bubbles and it seems pretty safe. Start but they don't last as long as I'd like. 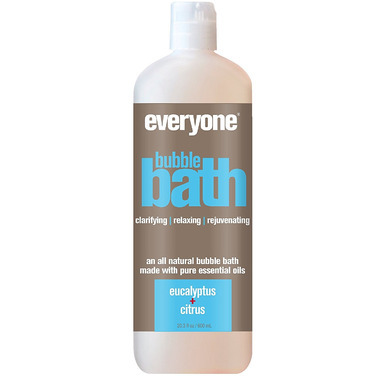 I had another, more expensive, eco bubble bath whose bubbles lasted longer and seemed fuller. This is decent for the price.